Neither Saturday's tornado warning, nor Sunday's unseasonable heat wave, diminished enthusiasm for IAC's first annual ITALIAN SPRING FESTA. Attendees came from as far away as Tallahassee and included past members, folks who found us for the first time, and City Councilman John Crescimbeni, who loves "all things Italian." Happy event goers agreed that the weekend event was a sensory delight. laughter erupting in the Kid Fun Zone; karaoke songs belted out by would-be American Idols; sausage sizzling on the outdoor grill; a single word on everyone's lips, "MANGIA." 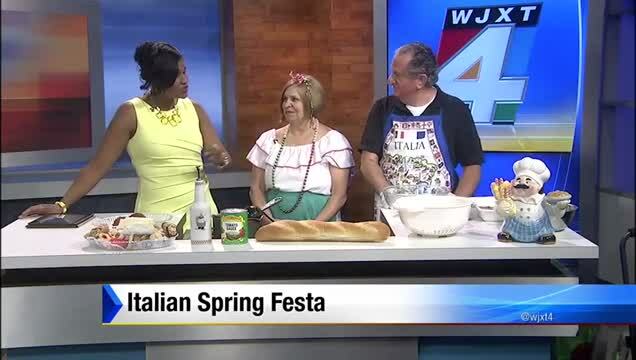 folks savoring homemade bakery delights; joyful introductions to sumptuous Italiano cuisine; 1000 meatballs, rolled by loving hands, to die for! SEE US ON THE MORNING SHOW!